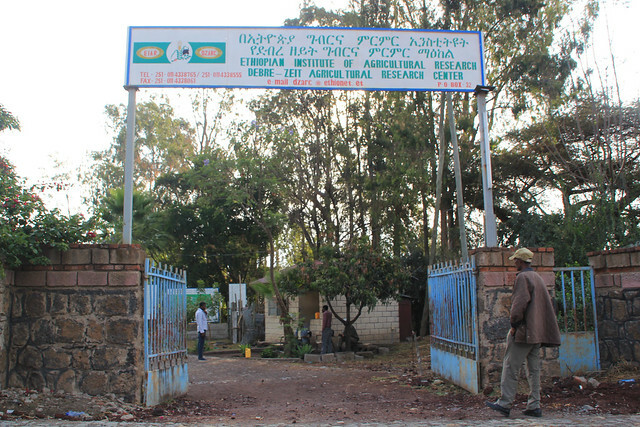 The Agricultural Research Centre in Debre Zeit, Ethiopia, where the selective breeding of Horro takes place (photo credit ILRI/Hannah Rollings). Wondmeneh Esatu, national coordinator of the African Chicken Genetic Gains (ACGG) project at the Ethiopian Institute of Agricultural Research (EIAR), has been working to improve the productivity of the indigenous Horro chicken through selective breeding since 2011. The program started in 2008 and Wondemeneh took over three years later, when it was testing its third generation of chicks. The program is now working on the seventh generation and expects to reach generation 10. The Horro breed is named after its geographic region of origin, located in the western part of Ethiopia, near the Blue Nile falls. There are about 30,000 chickens restricted to this environment. ACGG aims to breed chickens for village production systems by using mass selection to improve survival and productivity of the chickens. 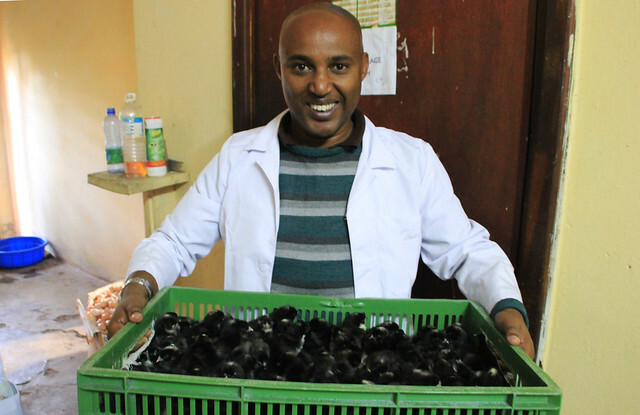 One of the main objectives is to make Horro chickens more profitable for smallholder farmers in Ethiopia, and to conserve their existing genetic diversity. Previously, imported chicks did not perform well, easily succumbing to disease and showing poor results. For this reason, the project team decided to focus on an indigenous breed. Wondmeneh Esatu with some newly-hatched chicks at the Debre Zeit research centre (photo credit: ILRI/Hannah Rollings). own a better performance in both on-station and on-farm tests. 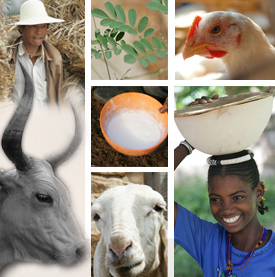 The development of the Horro breed is a success story for Wondmeneh and the team that has been working on it since 2008. The visible benefits will go a long way in helping smallholder farmers in Ethiopia and the work on the Horro breed will be used as a benchmark for improving other indigenous chicken genetic resources. Tags: EIAR, Horro. Bookmark the permalink. Realy, impressing congratulations! How smart it was if the color were not Black! I LIKE it!